Bikeology is a bicycle safety curriculum and parent guide that was just published by the American Alliance for Health, Physical Education, Recreation and Dance (AAHPERD) located in Reston. The guide was funded by the National Highway Traffic Safety Administration. 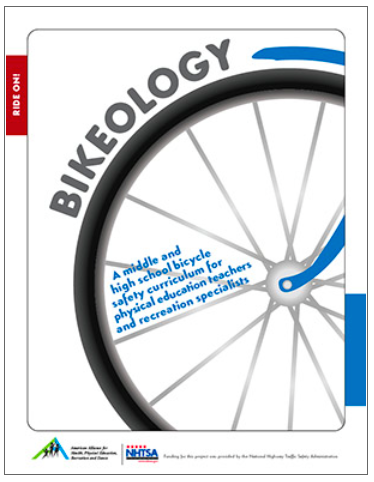 "Bikeology is a ready-to-use bicycle-safety curriculum for physical education teachers and recreation specialists working with students in grades 6-12." The 355-page curriculum includes seven units: Getting Ready to Ride, Bicycle Handling Basics, Emergency Bicycle Handling Skills, Advanced Bicycle Handling Skills, Rules of the Road for Riding, Bicycle Maintenance and Riding for Fitness. In addition to key goals and skills for each unit, it includes both written activities like themed word searches and instructions for setting up physical activities like practice rides. There's also a 34-page guide aimed at parents, with slightly more detailed information and advice. It's certainly not a much of a marketing document. "Bicycles are associated with more injuries and deaths than any other consumer product other than the automobile," the guide points out in a characteristic section urging every bicycle rider to use a helmet for every trip. If I received the curriculum or parent's guide without having already decided that it was a good thing to get my students or children on bicycles, I'd be terrified: none of the documents has a single photo of people enjoying themselves, and it's left to instructor and students to come up with ways to convey the pleasures and advantages of biking in addition to the tasks, responsibilities and concerns. That said, it's great to see the federal government making a serious effort to aid bike education at an age when we build our first transportation habits and too many girls, in particular, tend to abandon the activity. With Portland's own Safe Routes to School program expanding into middle schools this year, hopefully it'll be a useful tool. The publication was written by Vicki Miller of Virginia Commonwealth University and Heather Funkhouser who at one time worked at the Virginia Department of Health. The curriculum was tested in several schools in Virginia.